In an amazing example of just how out of touch they were with the American people Tuesday, CNN prefaced the release of their very positive State of the Union reaction poll by claiming it wasn’t representative of the nation. “It’s not representative of the country overall it is a poll of people who watched the speech. Well, who watches a State of the Union address? Fans of the person giving it,” declared Political Director David Chalian. After coming back from a commercial break host Wolf Blitzer was eager to get to CNN’s polling data and even more eager to discredit the poll as nothing special. “We’re now getting the first results of our instant poll of people who actually watched the President’s speech. David Chalian our political director is here, give us the numbers and give us the explanation that this is not necessarily a national poll,” he announced. Chalian was quick to point out that more Republicans were probably watching than Democrats. “So it is definitely an audience that skews a little bit more towards Republicans than Democrats in the Obama years it was the reverse,” he asserted before giving the very positive results. “Here’s what we found out. 48 percent of those who watched the speech tonight had a very positive reaction to the speech. 22 percent, somewhat positive,” Chalian reported. 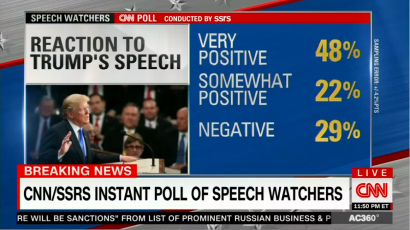 That means according to CNN’s own findings, 70 percent of those who watched the speech had some sort of positive reaction and less than 30 percent hated it. Chalian also noted how the poll also found that “62 percent of speech watchers tonight say that Donald Trump’s policies, as laid out tonight, will move the country in the right direction.” The positive reaction poll came after CNN host Jake Tapper and Chief Political Analyst Gloria Borger whined about Trump alienating people with his patriotic language. Take a look at this. 48 percent very positive reaction across the board. Barack Obama at the beginning of 2010, he had 48 percent very positive reaction. George W. Bush at the beginning of 2006, in his second midterms, 48 percent, very positive. As you know, those midterm elections did not go well for Bush or Obama. Donald Trump, the same place tonight, 48 percent, very positive in the reaction from speech watchers. These CNN journalists were very adamant about people not reading too much into the positive results for President Trump since the results were drawn from an allegedly Republican heavy viewership. But that begs the question: If you’re polling a skewed pool of people, then why take the poll at all? It because they like to tout the results when it’s a Democratic president giving the speech. Editor’s note. This appeared at Newsbusters and is reposted with permission.